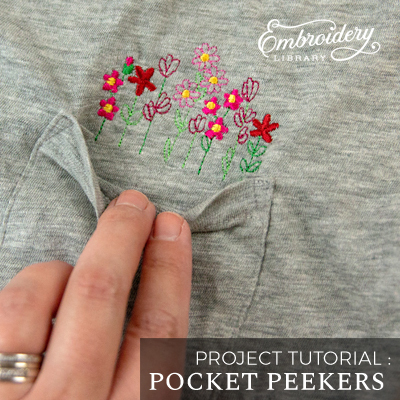 Bring a little whimsy to your wardrobe with embroidery peeking out of your pocket! 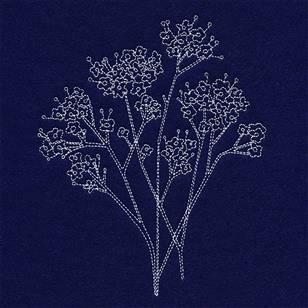 These unique motifs are specially designed to tuck inside the top edge of an open shirt pocket, creating the illusion that flowers are blooming from within. 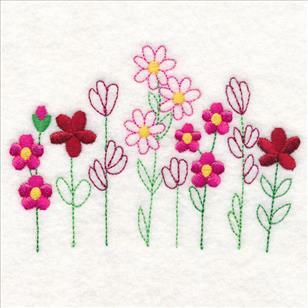 We'll show you how to stitch these unique, charming embroidery designs! 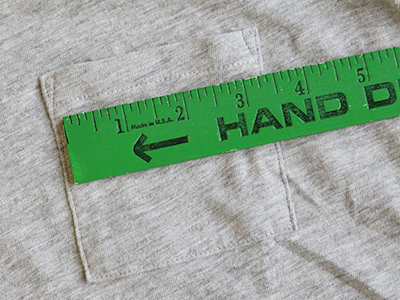 Measure the opening of the pocket, and select a design where the width is smaller than the opening of the pocket. For example in this tutorial, the pocket opening is about 3" wide, so we chose the smallest size of the design which is about 2.75" wide. 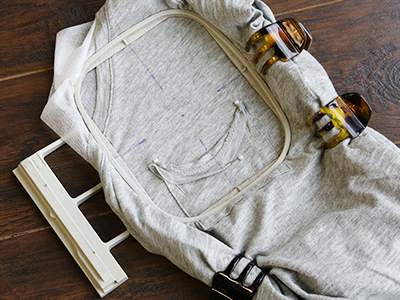 Turn the shirt inside out, and cut a piece of sheer mesh cutaway stabilizer that is larger than the hoop. 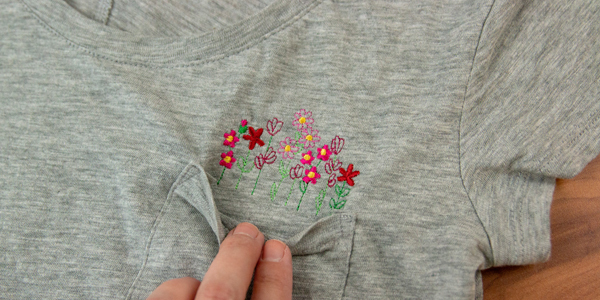 Spray the stabilizer with temporary adhesive, and smooth it on the inside of the shirt behind where the embroidery will be stitching. 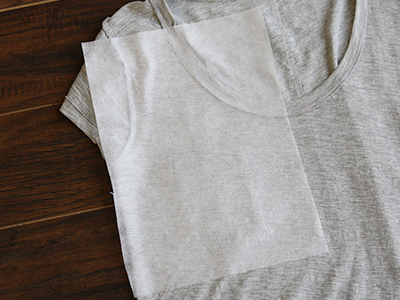 Then gently pull the open edge of the pocket down, and pin it in place. Make sure not to stretch the pocket out too much. 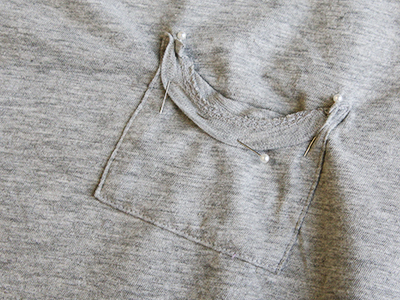 Over-stretching the pocket will cause the top edge to lose its shape and warp. 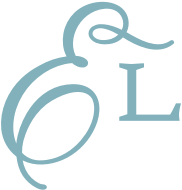 A template, or printout, of a design is an excellent tool to help with placement. 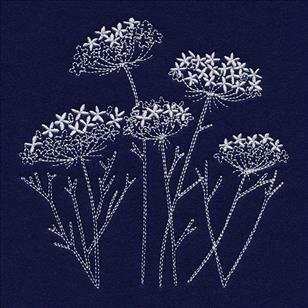 Print of template of the design using an embroidery software. 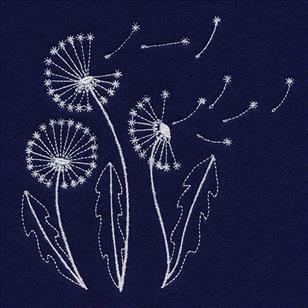 If you do not have an embroidery software, Wilcom TrueSizer is a free program to use. 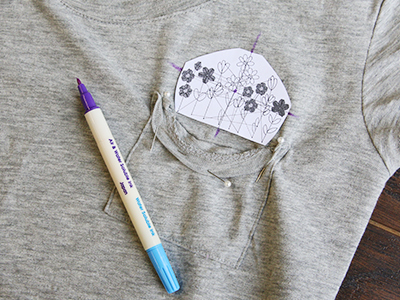 Arrange the template along the top side of the pocket, and make sure the bottom edge of the design goes about a 1/4" below the top edge of the pocket (so it will end up inside). Using an air-erase pen, mark the center point and the horizontal and vertical axis lines of the design. Extend the axis lines using a ruler and air-erase pen to make it easier to hoop accurately. Then hoop the shirt and stabilizer together tightly, lining up the drawn axis lines with the marks on the hoop. Some of the shirt (such as the neckline) may not be hooped, but as long as the stabilizer is, this is okay. 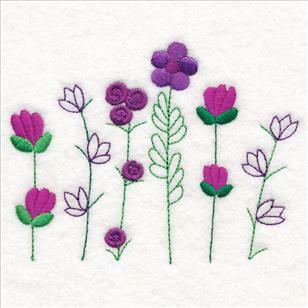 Load the embroidery file onto the machine, and secure the hoop in place. 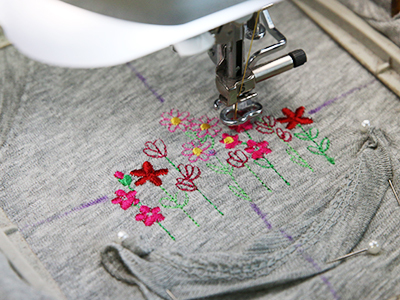 Then move the needle directly over the marked center point on the shirt. 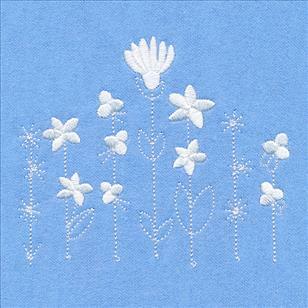 Follow the color change sheet, and embroider the design. 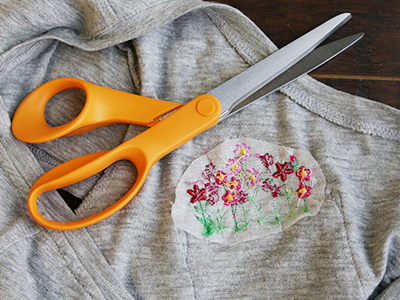 Once the embroidery has finished sewing, unhoop the shirt, and remove the sewing pins. Then turn it inside out, and trim away the excess stabilizer from around the design. 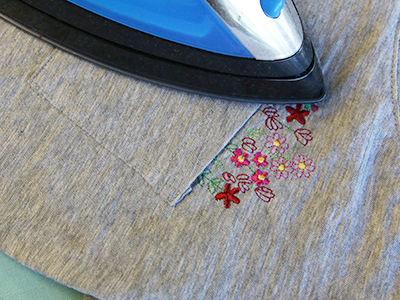 If the top edge of the pocket has stretched or warped at all, press it with an iron. For best results, make sure the steam is on. 4.86" x 4.85" | 4.25" x 4.24" | 3.85" x 3.84"